Designed to cut heavy winds and block debris in Tamarac, concrete vent blocks can allow fresh air and natural light to pass through, opening up your space and adding a layer of privacy. Atlantic Coast Precast is proud to offer precast concrete vent blocks in a variety of shapes, styles, sizes, and colors. We work closely with designers, engineers, architects, contractors or other industry professionals to cast custom product made from their unique samples, specifications, drawings, or sketches. With decades of experience, Atlantic Coast Precast can help you choose the perfect style for your Tamarac concrete vent blocks. 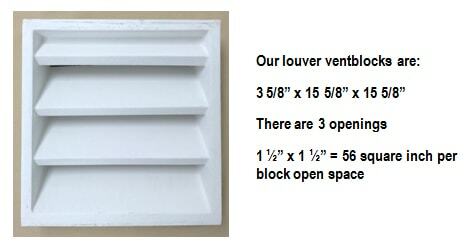 Whether you're interested in our functional two-piece vent blocks which allow air to flow through, trapping debris and maintaining circulation, or our decorative louvers for an all-around enhanced appearance we can help you get started today with a FREE quote. Since 1965, Atlantic Coast Precast has offer sustainable products and cost-effective rates with easy, fast installations and plenty of flexibility in the design and production of your vent blocks. For warm, humid climates like Tamarac, concrete vent blocks can be a smart way to keep your space cool and open while keeping moisture out of your foundation or other structural spaces. Without these blocks, mold and damp rot could become a major problem. Call to get started.